Do you remember our second birthday event last year being a mystery? Many of you were shocked when we announced the event would involve abandoning our traditional structure and try something new that enabled our community to actively participate and engage with others in the community about topics that were important to you. The feedback from this event was incredible! We heard from so many of you about how much you LOVED this level of participation in learning, connecting, and sharing with people in the community and that we should do it again! We are celebrating our third year as a CreativeMornings chapter this month, and we are hosting one of our craziest events on Friday, January 26th! We’ll gather at the Henry Clay for breakfast and coffee and then move into our main activity of allowing you to participate in discussions with other creatives to discuss various topics that are important to you! 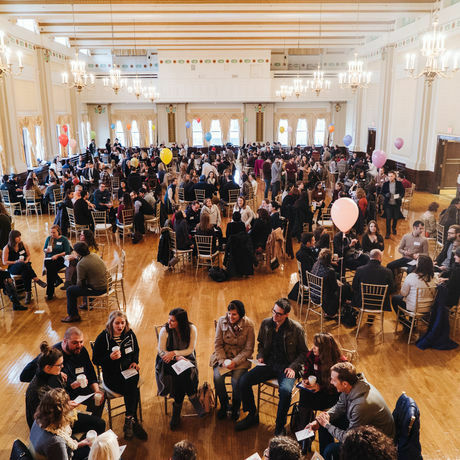 It seems fitting that this month’s theme is Anxiety, and we challenge you to set aside your fears and join us for one of our favorite events of the year that truly makes our large CreativeMornings community feel small and more connected. What role can art play in social change? We know there are more topics and questions you would like to discuss with other creatives in the room so if you have some ideas that you would like to share then please fill out this form! Registration opens Monday, January 22nd at 9:00 AM! We hope you will be able to join us and celebrate another successful year of CreativeMornings! GE Appliances makes life better by designing and building the world’s best appliances. From design to production to service, their goal is to help people improve their lives at home. Learn more about GE Appliances. The Community Foundation of Louisville is a force for good. As a leader in philanthropy, we connect donors, nonprofits and civic partners to create lasting impact in the community so people and place thrive. Founded in 1984, the Community Foundation is the largest charitable foundation in Kentucky.